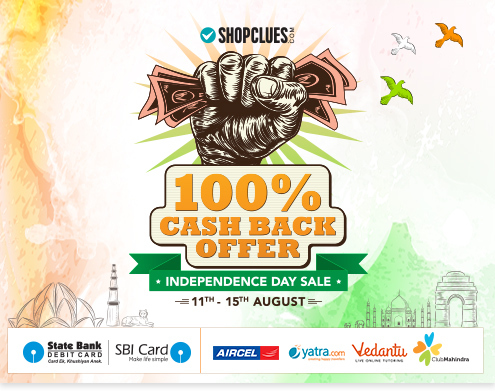 The 100% Cashback Offer is valid from August 11th – 15th, 2015, and will be given in form of Cluesbucks only. The Offer is applicable across website, mobile site and mobile app. Minimum Cart Value of Rs 690 (69th Independence Day) is mandatory to avail the 100% Cashback Offer. For Orders worth Rs 1000 and more, maximum Cashback of 1000 CluesBucks can be availed. Offer is valid across all platforms, Desktop Site, Mobile Site & Mobile App. Offer is valid on both Prepaid and Cash-On-Delivery Orders. Cashback based on your purchase will be issued in form of CluesBucks, after 10 Working Days of your Product’s delivery from I-Day Sale. CluesBucks earned from I-Day Sale should be redeemed within 10 Days from date of issue. ShopClues reserves the right to change or cancel the promotion as its sole discretion. Any fraudulent activities including creating duplicate accounts, aliasing, placing multiple orders or violating the terms and conditions, will lead to order cancellation.